Some of you have asked if I could feature designer pieces from my closet. I thought I'd pick out some of my favorites, most of which I've had for years. You've probably seen quite a few of them before too. I purchased this Hermes clic clac bracelet more than 5 years ago from a consignment store in Auckland for a song. It's hung on a handmade coffee cup and saucer set from Cappadocia, Turkey. I bought the set from a tiny store right by the Uchisar castle which sold antique knick-knacks. The silver exterior holds a ceramic cup which keeps the coffee hot. I was informed by the old man who was also the shop owner that it took his friend 2 weeks to make this. 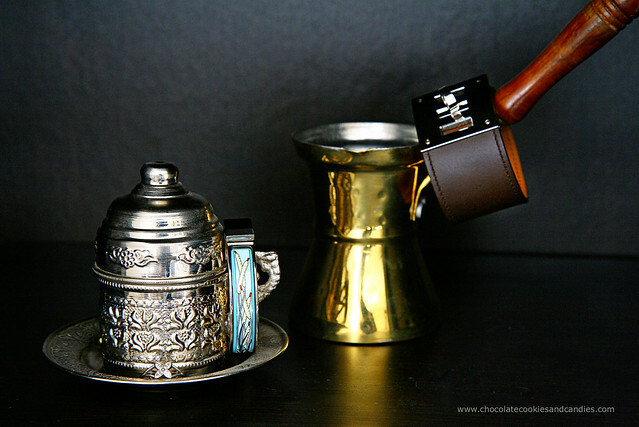 The brass coffee pot came from an incredible coffee shop in Crete roast and grind their own coffee beans. I was thrilled to find this Hermes Kelly Dog bracelet at Hermes sale in Paris. I've worn it quite a bit. Hopefully, one day I might be brave enough to wear a Collier de Chien bracelet. I fell in love with the teacup display rack on a visit to Kuala Lumpur more than 11 years ago. I was out shopping with my aunt when I walked into a teahouse selling the most glorious tea leaves and all the necessary accoutrements. 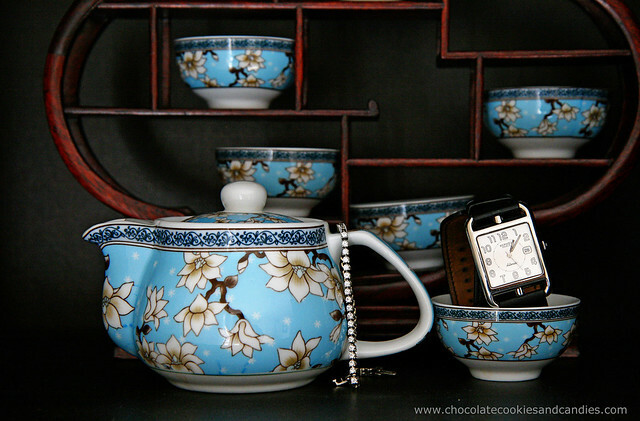 The Chinese tea set was last year's purchase from Kuala Lumpur as well when I stopped over to visit a dear friend of mine. The hearts and arrow diamond tennis bracelet was a gift to myself after years of lusting for one. It's 5 years old and I've never taken it off except for this photoshoot. I've often forgotten it's there until a friend mentions how much the diamond glitters. A good friend of mine, S from NY had been hooked on these ever since she showed me hers. The Hermes Cape Cod automatic watch was a 10th wedding anniversary gift from hubby last year. I was thrilled beyond words when a wonderful sales associate at the Hermes store in Hong Kong managed to hunt the buffalo horn Lena necklace for me. I've worn it so much in the last 4 years. 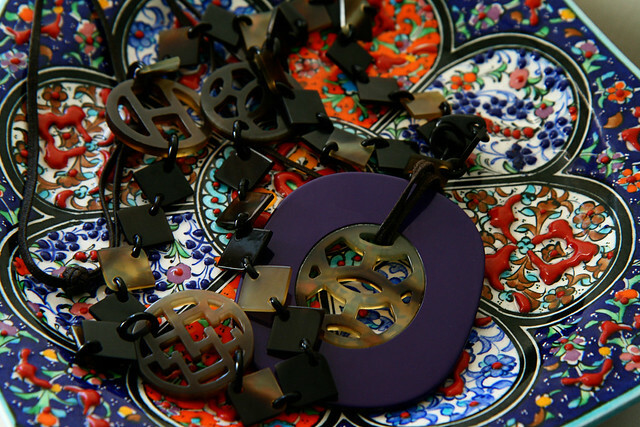 The purple Hermes Lift GM pendant was a lucky purchase at the Hermes sale in Paris earlier this year. I was determined to find a hand-painted plate before leaving Cappadocia, Turkey. This colorful plate took approximately a month to paint and glaze. 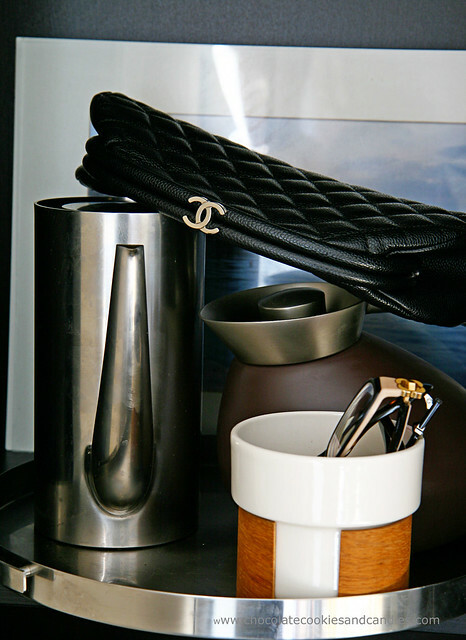 It took me forever to locate a Chanel Timeless clutch in Caviar leather and silver hardware. Like everything else in my closet, the clutch has been used quite a bit. I've managed to stuff food....and just about everything into this clutch. The two pairs of glasses were gifts from hubby on my birthday. Hubby loves to collect Georg Jensen coffee pots. The pot on the left is called Quack because I presume it looks like a duck??! My Kelly 28cm is probably one of my most used bag sitting on top of hubby's favorite Panton chair. It goes with absolutely everything in my closet and holds a lot of my junk which is rather surprising considering its size. 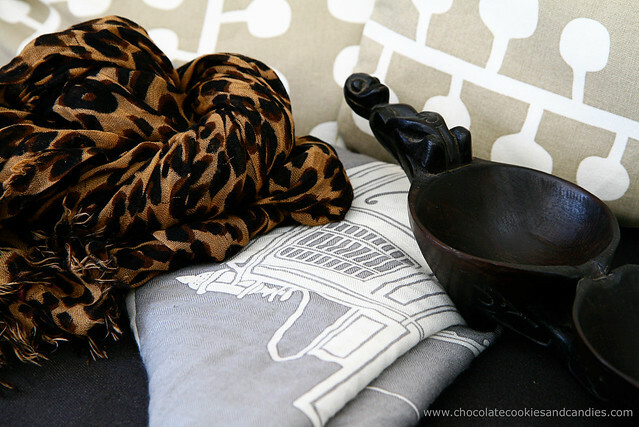 These are two of my favorite shawls which I wear all year round. As you can see, my Louis Vuitton leopard shawl has plenty of runs. I fell in love with the Hermes Ex Libris shawl when I first tried it on at Hermes store at Sloane St. The sales associate tried to dissuade me from buying it saying that the grey/white version made me look old. Guess, she was never taught diplomacy. Unfortunately, I decided to sleep on it and when I called the next day, it was gone. Thankfully, I managed to locate one at the Hermes sale. I found this wooden Dayak medicine bowl when I went back to Borneo to visit my grandmother many years ago. 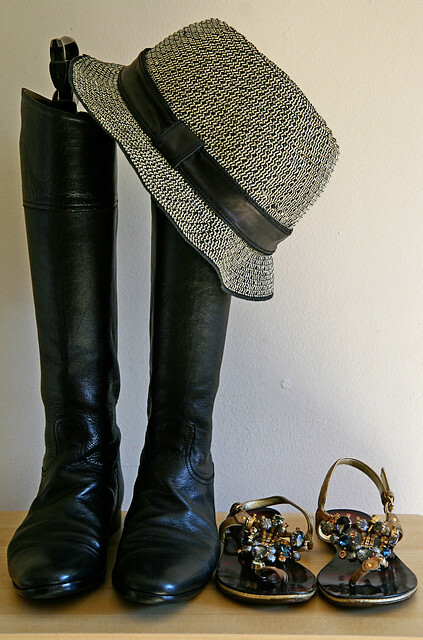 My Hermes Story boots was a lucky find at a consignment store many years ago. I think I paid 1/3 of the retail price despite the fact that they looked barely worn. I resole them every year but boy, are these boots great investments or what. They're so comfortable and last forever. The Giuseppe Zanotti embellished flats have been featured so often in my blog that I'm sure many of you are bored with them. They're my best scores from the On Pedder sale in Hong Kong 4 years ago. My Jigsaw trilby is a lifesaver. No more headaches when I'm under hot blistering sun. Now let me tell you the story of my Ikea chest of drawers. You're probably thinking, geez, it's just Ikea. You see, I coveted Ikea furniture. No, you didn't misread the previous sentence. I used to pore over the Ikea catalogue pilfered from God knows where. When I moved to the UK, I informed hubby that we're going to get ONLY Ikea furniture. Hubby who grew up in Australia and was used to seeing build-your-own-rubbish-but-cheap-and-appealing-furniture thought I'd gone barking mad. I built this chest of drawers with my bare hands. I mean, my dad could make furniture, renovate houses, resuscitate any dying plant surely he would've passed his DNA to me. Or so I thought. Within a month, it started falling apart. Now, it's holding up purely by prayers and a few screws that I'd knocked in place. Chanel RTW is waaaay beyond my budget so I'm concentrating on Isabel Marant clothes instead. This Isabel Marant Atiki arrived in time before the cold snap sets in. I can't remember when I bought my Hermes belt because it has been that long. I wear it practically everyday. I hope you've enjoyed a glimpse into my closet! I'm in love with every & each piece of your post !! Amazing pictures you have such fine taste!! I'm a huge admirer of individuals who build their style around favorite pieces and cuts. Maybe it's just that I identify with my precious objects, so I look for kindred spirits. Your accessories are beautiful--just like you. all your pieces are absolutely amazing and well kept! you really think through your purchases. that Chanel cluth is beautiful!! Very interesting, you can tell a lot about a person from her selection of favorite things! Yours is such an eclectic collection that I adore! Great taste! Kim, looks like we both have an obsession for tea sets. There are more which I've dumped into a chest. The caviar leather is incredible. I'm careful with my bags but I don't baby them. The Chanel clutch still looks like new despite being worn so much. I love classic pieces since I'm not all that great with following trends. Lamia, thank you for dropping by. Thank you so much for the lovely compliment. AA, I'm very touched by what you've said. Thank you from the bottom of my heart. I think long and hard before purchasing something to ensure it works with the rest of my wardrobe. Sharon, the LV shawl seems to lose its weave fairly quickly. I think I would've cried buckets if I'd purchased it at full retail price. It's still one of my most worn shawls. The Kelly Dog bracelet makes me feel so unmommy like. LOL. ShinyPrettyThings, you couldn't have nailed my style more accurately. I prefer to keep a small closet which suits my lifestyle and flatters my figure. Lily, you're so sweet! I don't have a lot but what I do have, I really put them to good use. This was one of my favorite of your blog posts!! Gorgeous pics and your lovely, well thought out treasures!! Thanks so much for sharing your favorites! The way you photographed them is just magnificent. It belongs in an editorial! Seriously, I loved looking at each item and reading your description! Fabulous pieces and excellent presentation together with your furniture and household items! I love it! Especially when paired with other treasured items from the home. I was so homesick once that I requested my mom to purchase a set of teacups that you commonly see at chinese coffee shops -- those places where you drink a kopi-o and have bread with kaya and butter...yum! Mandi, thank you so much. Photography is my only creative outlet seeing that I can't draw nor sing (I've been known to make dogs howl) nor garden (I've killed every plant I've ever touched). lauraloo, you've always been one of my staunch supporters. Never fail to encourage me with your comments. Sam, I just love Ikea catalogs. My friends think I'm strange but honestly, these guys sure know how to style a room. Thank you so much. Photography is a passion of mine which I'm hoping to improve over time. Bessie, I had two Kellys but let one go because it's too expensive to be a showpiece. If only I could feed it steroids so that it can grow another 10cm. I love buffalo horn necklaces and I've worn mine a lot. DA, thank you! Glad you like it. bagfashionista, some of these are my favorite pieces that remind me of Borneo. If I could, I would love to buy those round tables and stools that one often find at Kopitiams. Just found your lovely blog and am following you now on bloglovin! You are one lucky mama to have so many gorgeous pieces in your closet- can't wait to see more! I missed your blog updates for days without realizing that I was clicking onto an old link which stopped at an old post all these days! Silly me! Luckily something struck me & I refreshed the page & saw so many posts which were missed...lol! skippysays, I'm so glad you like the blog. Thank you for taking the time to read. StefPatt, you're very kind. Thank you so much. I'm thrilled you like my favorite pieces. I've made my fair share of mistakes and it truly pained me to find out how much money was flushed down the drain. chicology, LOL. I'm glad you like them. You'll notice that there aren't any close up photos as they're very worn! my mom have those in her house. My grandmother too --- those rosewood table & stools with the marble on the top right? I find that I tend to appreciate these things more when I'm away from home, in a foreign land. Steph, YES!!! That's the one! Do you know where I can find these? I love those thick ceramic coffee cups. My granny taught me how to pour hot tea into the saucer and slurp it up. Hahahaha! I don't do it now and will be mortified if Lil L does the same at a cafe here. wow, everything's beautiful! 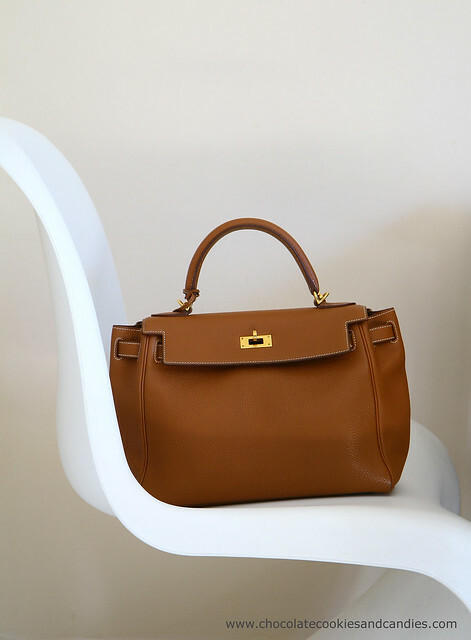 i don't like hermes kelly bags--i think they are overrated--but i love the one you have. the color's just my taste. i can imagine you in the black boots, the tan bag and the lv scarf (adore it!) --wow you must be so glamorous! when can we see how you look like in all your finery?! Thank you, Terri! I don't know about being glamorous but it's so sweet of you to say so. I hate being photographed so I guess you'll have to see me in real life to judge for yourself. Hi Satu, thank you for dropping by. The Kelly is a Gold 28cm Retourne in Taurillon Clemence. You have a beautiful wardrobe and I so love your way to keep a blog. Wonderful pics!! Will continue to following it! My pleasure, Satu. And thank you for the sweet compliment. I started off being rather obsessed with Birkins but over the past few years, I've found that the retourne Kelly suits my casual lifestyle more. Don't hesitate to ask if you need anymore information. I'll have to contact you if I get the chance to go to KL again. I really want those rosewood tables and stools. Cute post! I love that you combined some of your favorite fashion pieces with your favorite knickknacks/decor. Bessie, if you ever see the price tags on teeny tiny diamonds here in the UK or NZ, you'll faint. I got several quotes for a 3ct tennis bracelet from various jewelers and they were 3 times more than what I'd get from WhiteFlash and definitely far interior diamonds too!